What does that mean? What type of chemicals are used in producing this? How much energy is used? What happens to the by-products? I don’t know the answers, but I’m not convinced this is an earth friendly product. It is great that we can make plastics from renewable plant material to replace petroleum based plastics. On the other hand, replacing organic cotton and organic wool with PLA in an organic mattress certainly is not as earth-friendly or natural as just using organic cotton or wool. The Natural Sleep Store sells some products that contain PLA. I’m clearly not a fan, so why do we sell these mattresses? 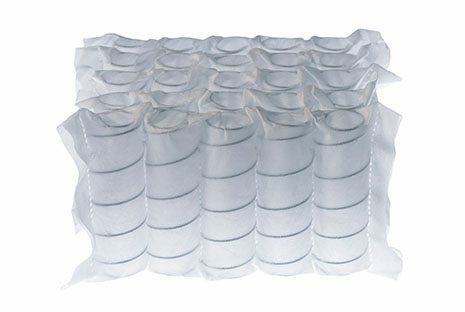 Pocket coil mattresses have become much more popular over the last few years. In order to create a pocket coil unit, individual springs are enclosed in fabric, so that they are not attached to other springs (like a traditional spring unit). But, in order to enclose each coil in fabric, you have to either sew, glue, or melt the fabric together. A plastic material like PLA is perfect, as a machine can just “melt” the fabric together around each individual coil. When you are dealing with possibly over 1000 coils in a mattress, sewing this or gluing it would be time intensive and expensive to say the least. Although not as natural as I like, we like to respond to our customer’s wishes, and customers ask for pocket coil mattresses! Customers like the fact that a pocket coil mattress responds to the body better than a traditional innerspring unit. In a pocket coil mattress individual spring units can compress without making the mattress tip and dip as it would if all the springs were connected. Making customers happy is of the utmost importance in our business, so although it was a hard decision, we decided to sell pocket coil mattresses with PLA. Our first priority is to provide our customers with safe and healthy mattresses. PLA is not toxic to sleep on and it does not out gas toxic chemicals. It is fairly inert in its solid state. So, whereas I don’t think it’s a totally natural product, I know it is not harming anyone, and using PLA is providing our customers with the pocket coils they are requesting at a reasonable price. For example, we have one fabulous pocket coil mattress by OMI, The Rossa. The coils are wrapped in PLA, but the rest of the mattress is made with organic latex, cotton, and wool; some of the purest materials you can find. It is GOTS certified and sold at an amazing price point! OMI has made the commitment to making sure all the other materials are certified organic and pure. One thing to watch out for is mattress manufacturers who use PLA batting in conjunction (or in place of) wool batting. The most likely reason to use PLA batting in place of wool batting is to cut cost. If we start putting less expensive materials in place of more expensive, pure and organic materials, where do we draw the line? Maybe at that point, a non-organic mattress is the way to go. If you are paying the premium for an organic mattress, insist that as much of the mattress as possible is organic!